Gary P. Naftalis is one of the nation’s leading trial lawyers and pre-eminent litigators. Mr. Naftalis represents corporations, as well as officers, directors and significant individuals, in all phases of complex high-stakes civil, criminal and regulatory matters. His work on behalf of these clients spans more than four decades and includes many sensitive and high-profile matters, including governmental and regulatory inquiries and related civil litigation involving allegations of insider trading, market manipulation, accounting irregularities, stock options backdating and other financial fraud. Mr. Naftalis has also argued significant appeals in appellate courts throughout the country. In addition, he has served as counsel to audit and special committees of a number of major public companies in connection with regulatory issues. Mr. Naftalis’ most notable work on behalf of clients includes his successful defense of Michael Eisner, the CEO of The Walt Disney Company, in the shareholder derivative lawsuit related to the hiring and termination of Michael Ovitz. After a 37-day trial in the Delaware Court of Chancery, Mr. Eisner and the other Disney directors prevailed on all counts. The National Law Journal chose the Disney decision as one of the top defense wins of that year. Mr. Naftalis also successfully secured dismissal for Kenneth Langone, former chair of the New York Stock Exchange Compensation Committee, of all charges brought against him by then-Attorney General Eliot Spitzer relating to the compensation of NYSE Chairman Richard Grasso. Following a decision by the Appellate Division of the New York State Supreme Court directing dismissal of the lawsuit, the attorney general announced he would not appeal and dropped the case. Other notable matters include the representation of the city of New York in the inquiry by the New York County District Attorney relating to the fire at the Deutsche Bank building at the World Trade Center, in which no charges were brought against the city or any of its agencies or its officials, and the defense of Sirius XM Radio in a breach of contract action by Howard Stern seeking $330 million in damages, in which Mr. Naftalis secured summary judgment in favor of Sirius dismissing the case. The court found that the “clear, unambiguous language” of the contract defeated Stern’s claim. The Appellate Division of the New York State Supreme Court unanimously upheld the dismissal of Stern’s lawsuit. More recently, Mr. Naftalis defended Rajat K. Gupta, the former Managing Director Worldwide of McKinsey, in both a high-profile criminal insider trading trial and parallel SEC enforcement action, where he obtained a precedent-setting decision challenging the attempt by the Securities and Exchange Commission to utilize an administrative process rather than go to court. Mr. Naftalis successfully represented Congregation Jeshuat Israel, the congregation that has worshipped for the past 130 years at Touro Synagogue, the nation’s oldest synagogue, in a dispute with a New York City congregation over the ownership of the synagogue and valuable silver bells (rimonim) that adorn Torah scrolls and were made by colonial silversmith Myer Myers. After a two-week trial in federal court, Jeshuat Israel prevailed on all issues and will now be able to sell the bells to create an endowment that will enable it to preserve the historic synagogue located in Newport, Rhode Island, as a place of worship. The Court also removed the New York City congregation as trustee of the charitable trust holding Touro Synagogue. The American Lawyer Daily named Mr. Naftalis as Litigator of the Week for this trial success. Mr. Naftalis has long represented numerous securities industry clients in sensitive “bet the company” matters, including federal and state criminal actions, SEC investigations, and civil litigation. He successfully defended Salomon Brothers in the federal criminal and SEC investigations of U.S. Treasury auction bidding practices, and Kidder, Peabody in connection with the Wall Street insider trading scandal. In both instances, he persuaded the U.S. government not to bring criminal charges. He also represented Kidder, Peabody in multiple related civil litigations in which the company faced more than $2 billion in damage claims. Mr. Naftalis is a fellow of the American College of Trial Lawyers. He has been repeatedly recognized as one of America’s premier litigators and trial lawyers. The National Law Journal named him a 2015 White Collar Trailblazer and also named him one of the “100 Most Influential Lawyers in America” the past two times it has compiled the list — in 2013 and in 2006. The Legal 500 has named him one of the “10 Leading Trial Lawyers in the United States” every year since 2007 when it first compiled its list, and Super Lawyers also has named him one of the “Top 10 Lawyers in New York” every year since 2007 (ranking him No. 1 in 2008, 2012, 2015 and 2016, and No. 2 in 2009, 2010, 2013 and 2014). Mr. Naftalis has been recognized as a litigation star in Benchmark Litigation since 2008, and received the Lifetime Achievement Award in 2014. In 2015, he received the Milton Gould Award for Outstanding Oral Advocacy from the Office of the Appellate Defender. In 2012, he received the New York Council of Defense Lawyers Norman Ostrow Award in recognition of his white collar defense achievements. Mr. Naftalis also received the 2011 Chambers USA Award for Excellence in White Collar Crime and Government Investigations. He has been recognized by Best Lawyers in America since 1993 in five categories — Bet-the-Company Litigation, White Collar Criminal Defense, Regulatory Enforcement, Securities Litigation and Commercial Litigation. He was also cited as one of America’s leading lawyers by Lawdragon 500 every year since 2006, and named a Lawdragon 500 Legend in 2016. He has been named as one of America’s leading trial lawyers by Chambers Global and Chambers USA and as one of the nation’s most highly regarded business crime defense lawyers by Who’s Who Legal. In 2016, Chambers USA said: “‘Giant of the Bar’ Gary Naftalis is a nationally recognized trial lawyer whose experience includes some of the largest criminal and civil cases in recent history.” Chambers also named Mr. Naftalis one of the top four “star individuals” among white collar criminal defense lawyers in New York. Mr. Naftalis’ litigation successes have been the subject of numerous profiles over the years, including the New York Times in 2011 (“Columbo with a Law Degree”); the Wall Street Journal in 2006 (“The Zelig of the White Collar Bar: He’s Everywhere”) and in 2011 (“Gary Naftalis: Back in the Spotlight Again”); Super Lawyers in 2010 (“The Ultimate Lawyer Statesman”); The American Lawyer in 2006 (“The Velocity of Gary”); and the fall 2014 ABA Litigation Journal. In addition to the many honors he has received over the course of his career from within the legal profession, Mr. Naftalis was awarded the Benemerenti Medal by Pope Benedict XVI. He also received the Robert M. Morgenthau Award for the Legal Profession by the Police Athletic League, the George A. Katz Torch of Learning Award by American Friends of the Hebrew University, the Law and Society Award by New York Lawyers for the Public Interest, the Robert F. Wagner Jr. Award by the Citizens Union of the City of New York, the Judge Simon H. Rifkind Award by the Jewish Theological Seminary, the John J. McCloy Award by The Fund for Modern Courts, and the Saint Thomas More Award by the Inner-City Scholarship Fund. Earlier in his career, Mr. Naftalis served as Assistant U.S. Attorney in the Southern District of New York and Deputy Chief of the Criminal Division. He also served as Special Counsel to the U.S. Senate Subcommittee investigating abuses in the nursing home industry. Mr. Naftalis has been a lecturer at Columbia Law School and a member of the faculty of Harvard Law School. 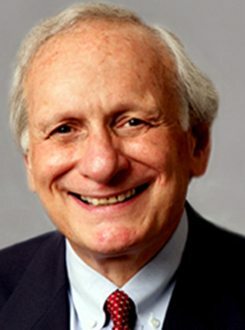 He is the author of numerous books and articles, including leading works on the grand jury system, The Grand Jury: An Institution on Trial (with the Honorable Marvin E. Frankel), and sentencing, Sentencing: Helping the Judges Do Their Jobs (also with Judge Frankel).